Could I Ever Live in a Tiny House? While in Califonia, Luther, my husband and I went to see our friend Dominique Moody (link is added at the end of post.) She has been working on her tiny house for years. Every year that visited California, I would visit her to see the progress. She was never in the same place - Watts, Altadena... this time was the furthest from were we were staying - 2 1/2 hour drive to Joshua Tree. Where the completed home resides at the moment. 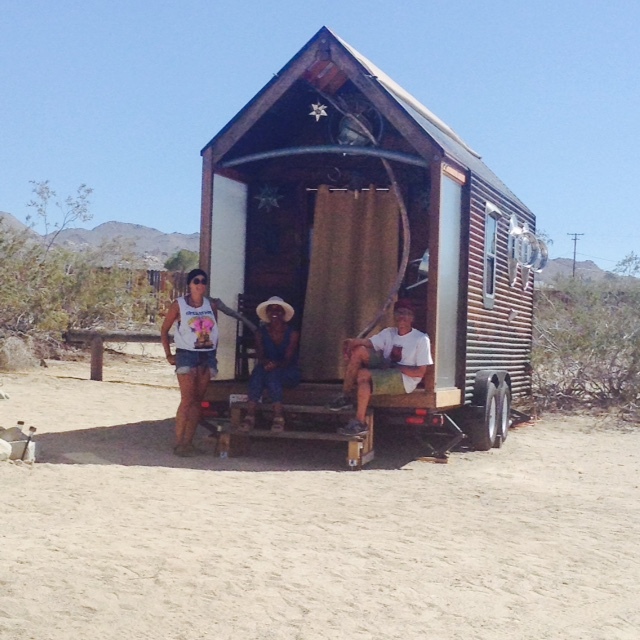 Luther and I had an amazing time sitting in her home called the 'Nomad.' We ate brunch and listened to her many stories of what she had to go through and where she might be next.. Other countries are interested in her traveling with the Nomad. Her home is under 150 ft. Comfortable for one if I didn't have my papers, books, art supplies... Where would I hang my art collection? Then I thought that I can maybe use a tiny house as my art studio. A large tiny house! Not sure how large it would need to be. Right now I'm using one of the bedrooms as my playroom. It's about 140 square feet. It's actually about the size of Dominique's home! And I feel cramped in my room. Right now I have a desk for paperwork, table for my beading, my husbands computer desk that I use all the time, small bookcases and storage areas. I desire another table to spread out my fiber art instead of bring stuff to the bedroom and spreading it on the bed. Ok, so if i have a seprate studio outside of my home, can I live in a tiny house? How large can a tiny house be? When is it considered not tiny? I think at this time of my life I can't live tiny. I'm slowly getting rid of stuff. But not enough to live tiny. I'm inspired by other people who do. More power to them.